Bruce Lawrence Taylor was born May 28, 1948 in Perth Amboy. Bruce and his younger brother, Brian, were exceptional athletes. Both starred for the Perth Amboy Panthers in high school—Bruce on the football team and Brian on the basketball team. Bruce stood an even 6’ while Brian went 6’3”. Bruce attended Boston University on a football scholarship in the 1960s. He was a standout for the Terriers from 1967 to 1979, playing defensive back. He was team MVP when BU went 9–1 his senior year. That season, he led the nation in punt return average and punt returns for touchdowns, and also led the Terriers in scoring. Bruce earned All-America recognition in 1969 and was voted the top college player in New England. 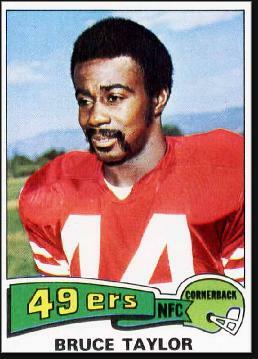 Bruce was the first defensive back taken in the 1970 NFL Draft. He went to the San Francisco 49ers, where he joined Jimmy Johnson in one of the league’s best defensive backfields. Bruce had a great first season with the 49ers and was named Defensive Rookie of the Year. He also earned Second-Team All-Pro honors. In 1971, Bruce was voted into his one and only Pro Bowl. In 1971 and 1972, he helped the team reach the NFC Championship Game—but both times the 49ers failed to take that last step to the Super Bowl. During his eight years in San Francisco, Bruce also served as the 49ers punt returner. He led the NFC with 516 yards in 1970, and with 34 returned in 1971. In 1975, his 13.8 average was tops in the conference. Bruce played his final NFL season in 1977. He tried to hang on with the Oakland Raiders, but did not make the team. After football, Bruce put his BU business degree to work and began working in the financial industry. From there, he became a Burger King franchisee, opening 18 stores in Seattle and Chicago. He fell in love with Florida on visits to the company headquarters and eventually he and his wife Terry relocated to the town of Trinity, on the West Coast, where they retired. After a long layoff from football, Bruce returned to the sport in 2009 when he joined Bob Hudson’s coaching staff at East Lake High. Bruce’s kids, Britt and Bianca, coached there. They twisted their dad’s arm until he agreed to volunteer. He has loved every minute of it.